First released in 2009, GoodReader marks its 10-year anniversary with a better-than-ever major upgrade, GoodReader 5. It's not easy to outperform ourselves after 10 years of delivering wonderful updates with extraordinary new features, but we did it! Again! Already top in its class, and everybody's favorite go-to tool, GoodReader just got significantly better. GoodReader is a perfect combination of document-reading and file-managing capabilities. It's your one-stop shop for all your document needs when you're on the go with your iOS device. Use the app once, and you'll be hooked. Soon you'll be wondering how you ever managed to work without it. -= File Reading =- PDF, TXT, MS Office, iWork, HTML, pictures, music & audio-books, videos. This is what you can view in GoodReader, plus you can also annotate PDF files and edit TXT files. 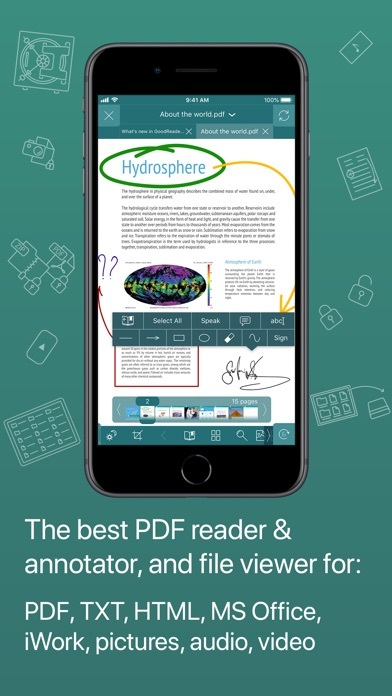 -= PDF Reading and Annotating =- PDF files is where GoodReader truly shines. Reading experience is so superior, it's hard to describe. To rephrase one of our customers' review, "try it, and you'll see." While you're at it, give our PDF Reflow feature a try. You'll be surprised how much better PDF reading goes when you don't have to scroll left/right all the time, for every single line of text. Annotating PDFs is another star feature of our app. Adding notes and drawings, highlighting text, and then sharing your annotated files or annotation summaries will be your main productivity and collaboration asset. 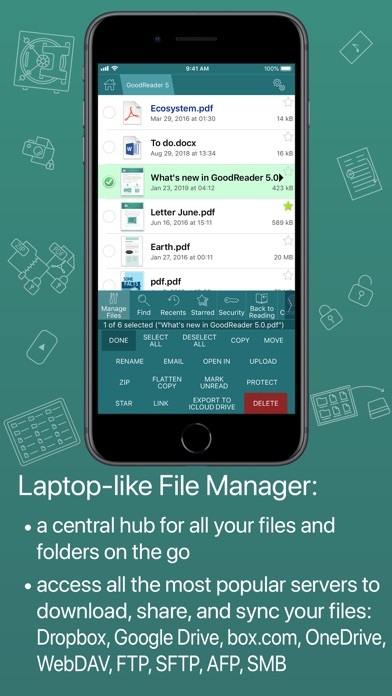 -= File Management =- While reading files is a big part of GoodReader, it's not all it can do. It can also serve as a central hub for all your files, even those that can't be opened by GoodReader itself. It's like bringing your personal computer experience to your mobile device — easily managing huge collections of files and folders will make you forget you don't have your laptop around. -= Connecting =- Dropbox, OneDrive, Google Drive, Box.com, WebDAV, SMB, AFP, FTP, SFTP — these are all accessible from inside GoodReader. Download, upload, and sync individual files or huge folder collections. -= Security =- With GoodReader, your data security steps up to the level previously only dreamt of. 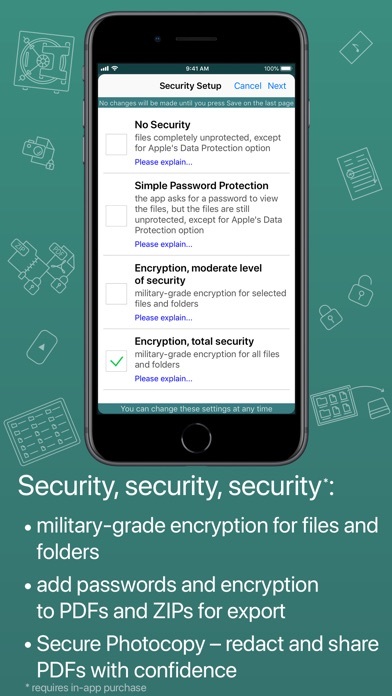 With Pro Pack (*), our new set of professional-level super-features, you'll get AES-256, a military-grade encryption, for all your data, at a price of a cup of coffee! And it's completely independent from the built-in Apple's Data Protection, so even if a hacker steals and unlocks your device, your data will still be protected by another strong layer of security, our own. -= Split-Screen =- A part of the Pro Pack (*) add-on, this wonderful new feature allows you to split an iPad screen in half, to read two files side-by-side. And even two different parts of the same file! -= Privacy =- Our commitment is to never monitor any user activity or gather any analytical data through the app. There are no usernames, profiles or accounts to log in to. Use the tool at your leisure with ZERO monitoring. (*): Pro Pack is a paid add-on, sold separately from inside the app, as an in-app purchase.